A long-time associate of a U.S.-based Islamist terrorist organization, Muslims of America (MOA), has been arrested in Johnson City, NY. 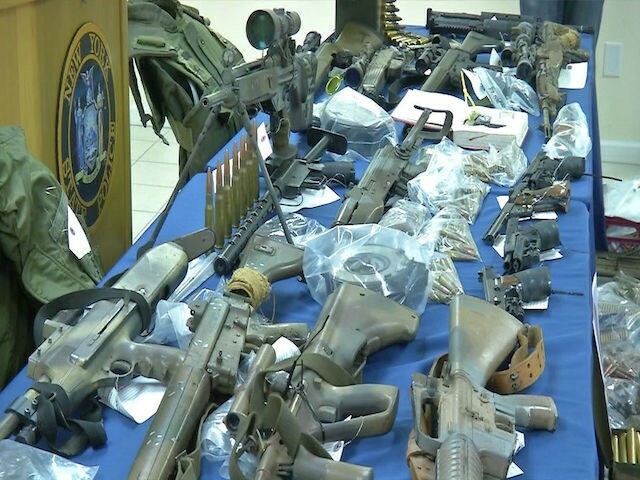 Authorities discovered that he had a large cache of weapons inside a storage locker. A source inside MOA says the weapons were intended for the group’s “Islamberg” headquarters in Hancock, NY. The suspect, 64-year old Ramadan Abdullah, was previously arrested in 1977 when he and another man tried to rob a candy store in Brooklyn and someone was murdered in the process. When police searched his home, they found enough material to build 50 bombs. In the end, the charges against Abdullah were strangely reduced (see below). On May 31, Abdullah was arrested after trying to steal four boxes of ammunition from a local Gander Mountain store. When police questioned him about the purpose of the ammo, his answers made them suspicious, and they obtained a search warrant for a storage locker he was renting in the town of Union. Searches of other residences linked to Abdullah turned up another loaded handgun, more high-capacity ammunition feeding devices and ammunition, including .38-caliber rounds. New York State Police Major Jim Barnes would not say whether Abdullah was connected to terrorist groups or any organizations, but confirmed that police believe Abdullah had made trips overseas. “There’s no indications there was a plan in place to commit an act of violence. However, it begs the question, what was he doing with all this and what were his intentions down the road?” said New York State Police Maj. Jim Barnes. “It’s just a tremendous blessing to be able to take all these high power weapons and high power ammunition off the streets, and who knows what kind of large scale tragedy that this investigation may have prevented later down the road,” said Johnson City Police Chief Brent Dodge. Abdullah is currently being held in the Broome County Jail without bail. Abdullah is a longtime associate of the U.S.-based Islamist cult Muslims of America. Read the full story at Clarion.